I don't often reread books these days. There are just so many others I want to read, so I tend not to revisit even books I liked very much. Last week while on vacation, I finished a book during a day trip to lovely Houston, Minnesota, and I was kicking myself for not having my next book along. While watching my boys play with their cousin at a lovely playground, it occurred to me that I'd really enjoyed the book I just finished, and perhaps I could try reading it again while I sat in the shade. 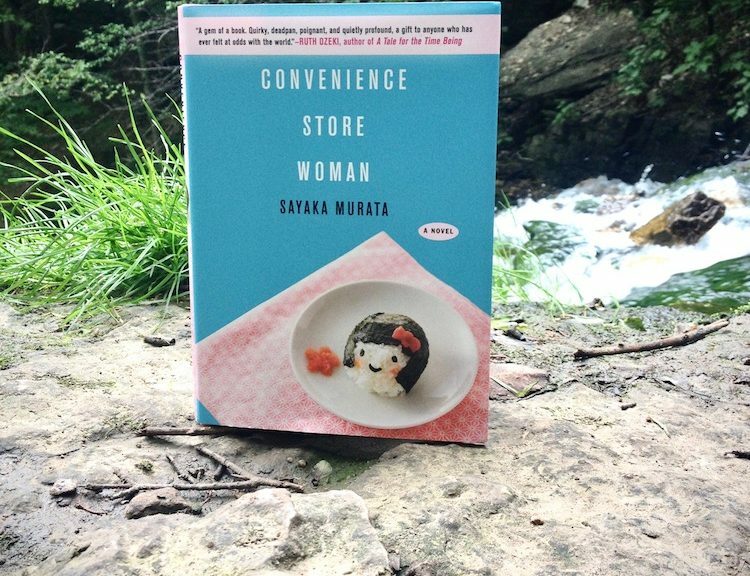 Convenience Store Woman is a fascinating little read by Japanese novelist Sayaka Murata, and I first heard about it from this article in the New York Times. The main character, Keiko, has had a part-time job at a konbini for the past eighteen years and has never had a romantic relationship, and these two things make her decidedly not normal according to her parents, her younger sister, and her peers. She relishes her defined role at the convenience store; within that environment (unlike the rest of the world), she knows exactly what is expected of her. The prose is simple and easy to follow, and Keiko is an enjoyable enigma. As Katy Waldman wrote in the New Yorker, "For the most part, her manner is that of a friendly alien scientist, but, at times, she swerves toward the psychopathic." What does it all mean? What exactly is the novel a commentary on? Would a Japanese reader interpret it differently than an American reader? I don't know, but I'm at the halfway point of my second read, and I'm enjoying picking up on little bits I'd overlooked the first time through. This topic is unusually appropriate to me now. I rarely read books again but with my flight to Minneapolis last week, I decided to take something I've already read in case I didn't get to finish it for awhile. I picked Dune as it has been about a decade since my last read. I somehow blitzed through 120 pages on the return trip after making it only 75 pages in on the flight to Minneapolis. I don’t often reread these days, either. I had a nearly decade-long streak of reading Hardy’s Far From the Madding Crowd every year, but that ended over a decade ago. Occasionally I’ll go back to give a book a second shot, which is what I did recently with Alan Watts’ The Wisdom of Insecurity. There are always others I know I want to re-read (it’s time I re-read the major Raymond Chandler & Haruki Murakami novels), so I try to schedule them in when I’m feeling in need of a break from, um, novelty. I recently finished Viet Thanh Nguyen’s The Sympathizer. I haven’t written my own review yet, but I think it’s one of the three best novels about the war. (The other two are Karl Marlantes’ Matterhorn & Alredo Véa’s Gods Go Begging; they each engage different perspectives on the war; reading all three would give a pretty good composite image of experience. O’Brien probably makes the top five.) If you like Dostoevsky or Ralph Ellison, you’ll want to pick this one up; Nguyen’s main character is every bit worthy of that comparison. I dropped Jeff Greenfield’s Then Everything Changed three-quarters of the way through once The Sympathizer hooked me, so I’ve finally circled back, more out of interest in putting it to bed than anything else. Speaking of Viet Thanh Nguyen, he has a beautiful essay in the New York Times about his son learning to read: "Losing My Son to Reading." That was an excellent essay; I hadn’t even considered that form of loss (yet to come for me, but now glimmering on the horizon at the rate we’re going). Thank you, Pepper. +1 on The Sympathizer. I'll check out that essay, @Pepper. Read Willam Manchester's American Caesar last month, a biography of Douglas MacArthur. It was spectacularly well-written, and certainly shared some of his flaws, but it was a little light on a few of the dark moments in his life (MacArthur's interaction with the Bonus Army most notably). I’ve been meaning to read Manchester for some time. I picked up a used early copy of both volumes of The Glory and the Dream several years ago, and have Goodbye, Darkness in the queue. I read his Churchill trilogy last year (ok, he definitely didn't write the last volume because the drop-off on prose was staggering), and it got me excited for more. The only book I can think of that I've read more than twice is Where the Red Fern Grows. I take that back. I have read Moo, Baa, La La La approximately a hundred times. But what about the hippopotamus? Relevant! Sandra Boynton's newest book, But Not the Armadillo comes out the day after Labor Day! The preview pages reveal: the Armadillo is male. But Not the Hippopotamus is one of my favorites from Boyton: just the right amount of text (sorry, Blue Hat, Green Hat), perfect rhythm and rhyme, a story (sorry, Opposites), no need to feign enthusiasm (many of her newer ones), that the story doesn't need the pictures. The writing is just perfect: "Hey come join the lot of us! ", the way the order of the animals from the first part is mixed for the second part. I can see working on these 150 or so words for years to get it right. I'd probably put it #2 behind The Going to Bed Book, which is the only book that I'm certain I've read more than 1000 times. The only of her more recent books that I'm fully behind is Night-Night, Little Pookie, but there are many I haven't read. Do you think the main character is autistic? If yes, does her portrayal strike you as authentic (recognizing of course that there are huge differences from one person with autism to the next)? Finished up Winter's Tale recently. One of the most gorgeously written books in the English language in the last quarter century of the 20th Century. You can argue with me about that if you like. I will just smile and nod politely and ignore you. This is one of the few books of fantasy or science fiction where I literally do not care whether the book pays attention to its plot, because the writing is so lovely that it is its own reward. This is also a book that I can love unreservedly without any authorial jealousy, because it is so far removed from my own skills and interests as a writer that there’s almost no intersection between its strengths as a book and my own talents as a storyteller. It’s nice to read a book without having an urge to pick it apart to reverse engineer it. That’s probably sort of right. I mean I’d stop short of saying I loved it. I adored many parts of it. It really is incredibly, heartbreakingly beautiful at times. And I was not very happy with other parts. I could see why many, or even most, people would hate it. It’s a big book and a time commitment, so you hope to not have to equivocate. Funny story, I follow Scalzi on Twitter, but just last night read his bio/intro because I honestly couldn’t think of what it was he did for a living. I then added Old Man’s War To my “Books to read” list. One of the reread books that immediately came to mind was This Raw Land by Wayne Short. My copy was a gift from my grandparents to my mom’s brother in 1968, which went back to them following his death in ‘86, and then to me following their passing. [edited reposting w/functional link] One of the reread books that immediately came to mind was This Raw Land by Wayne Short. My copy was a gift from my grandparents to my mom’s brother in 1968, which went back to them following his death in ‘86, and then to me following their passing. All of that, plus the way Short relates his experiences in Alaska, and knowing how my uncle lived his life in the years following Vietnam (similar in many ways to the author, though without a ‘happy’ ending) ... the book’s probably not for everyone, but I’ve read it at least 6 times. I finished my Hugo reading of the nominated novels for the year just in time for the final ballot deadline. Provenance by Ann Leckie was the last novel I finished. It's set in the same universe as all the Ancillary novels, but is a completely separate story. I wasn't too enthralled by it. An adopted daughter of a powerful family deals with political and/or military intrigue. Lots of questions of identity and privilege were tackled, but it didn't feel ... serious(?) enough to really have the impact that it could have. I also read Revenant Gun, the conclusion to Yoon Ha Lee's trilogy. It felt like Lee got too comfortable with the characters and the interesting bits of the first couple of books (empire/colonialism, neat mathematical magic systems, the main character) fell by the wayside to revel in the weirdness of some of the other characters. Spoonbenders by Daryl Gregory. This was a ton of fun. Everything I've read by Gregory takes the supernatural and then puts it right in the middle of the mundane and lets it slowly wind its way out of control. The Telemachus family is psychic/telekinetic/astral viewing/etc. but have fallen on hard times. It was really great to watch all the pieces come together and fall into place. The book felt like a magic trick performed with a wink. I also read two things outside of sci-fi/fantasy. This one has been discussed by others here, which convinced me to bump it up to the top of my reading pile. It was great. Each of the last three chapters was wonderful (and yes, the powerpoint chapter was my favorite) and finished this book off very well. A series of essays with famous women as their focus (and very often the girls that love them, or the younger self that discovered them), a theme emerges that is nearly indulgent, but instead is an embracing of what inspires Massey. It's an interesting and worthwhile journey to see how she finds that something in each case. As I read this I kept turning over the contrast of this with Jessica Crispin's "Why I am Not a Feminist" and its call to reject success within a patriarchal society as an unworthy goal of feminism. I went back and forth a bit on whether these books were opposed or if they were examining the same points from a different perspective. And I think this book is more of a document of how that fame or success is still on unfair terms and can so easily destroy the very thing that Massey wants to embrace, the genuine self that we associate with younger girls, before this world and its unfair structures make it impossible to carry on that way. It stops short of Crispin's polemic and never demands that the system be broken down. But both Crispin and Massey hold our reality up to the light and ask, "Is this what we really want?" Woohoo! I recall being ambivalent about that final, futuristic chapter of A Visit from the Goon Squad, but I'd be curious to see if my opinion would be different if I were to (wait for it) reread the book. Massey's book sounds like something I'd pick up. There's an interesting tension between wanting to tear the system to the ground vs. wanting to find ways to succeed within the system and/or transform it in some way without abandoning it. Massey's voice is interesting (very much not a strident tone) but consistent. It was a quick read, and if a certain essay doesn't grab you, you can skip to the next one, they're all very self-contained. Convenience Store Woman looks interesting - just ordered it. Awesome, I look forward to hearing what you think of it! It's also available on Hoopla, if anyone's library uses that app for e-books. Just finished. Quick read, and good recommendation. To your question: Do you think the main character is autistic? If yes, does her portrayal strike you as authentic (recognizing of course that there are huge differences from one person with autism to the next)? I don't think the author meant to cast Miss Furukura as a clinically challenged person, but rather with an extreme personality - a social malnutrant. While I was reading CSW I was reminded of Melville's Bartelby, Camus' Meursault, Star Trek's Data. Interestingly, Murata also works part-time in a convenience store. I'd like to read something else by her. Some creepy moments also: "...if it was just a matter of making him quiet, it would be easy enough." Yikes. Yes, I agree. Miss Furukura is a character and not a representative of a condition. That said, if Beau reads the book, he might have an interesting perspective on her based on his own professional and parental knowledge, which is where my question came from. I don't think any of her other novels have been translated into English, but I hope that changes soon. This may seem weird, but I am much more likely to read a book twice if I don't like it the first time through. I assume I must have missed something. I read Slaughterhouse Five for the second time last summer. I didn't like it when I was in college but I liked it a lot this time. I think it was a combination of knowing what to expect and having experienced grief that made it work this time. That makes a certain kind of sense. I have been wanting to return to Beloved by Toni Morrison. I read it probably close to two decades ago, and I'm really curious how having more life experience (and having children of my own) might influence my reading of it. Oh man... that would be the perfect book for me to re-read based on not liking it the first time. Crap. I really don't want to. But I kind of feel like I should. Yeah, I bet I would like it better. Same thing might go for Things Fall Apart. But man, I don't want to either. I'll just commit to reading more modern books. I'm rereading Kitchen Confidential this week in preparation for a book club of sorts. We're all going to make a dish either mentioned in the book or out of one of his many travels and talk about the book over dinner. I find his voice to be so strong that I can't not hear him while reading the book. I do a fair amount of rereading. Yeah, forgot to menton C&P, HnosK, and The Idiot as multiple re-reads. Hasn't everyone? And Camus' The Stranger, The Plague. Conrad's HofD, NoftheN, Typhoon and LJ. Golding LOTF. I reread a lot. I've read LoTR/Hobbit more times than I can remember. GRRM's unfinished series twice. During the second half of 2017 and 2018, it feels like I've been in a reading rut. I just can't seem to get into anything new. So I reread nearly all of Vonnegut's novels and have read Armegeddon in Retrospect and A Man Without a Country several times. I have a couple of local authors' books that take place in Northern MN in the fall. So I've been waiting to start those until I get up there in a couple of weeks. This weekend I picked up a bunch of poetry/drama collections (Yeats and E.E. Cummings mostly) to read something different and new. This has been a nice change of pace. Oh and I reread Corey Doctorow's Walkaway and Little Brother. Doctorow is probably my favorite author currently, and someone who is great to follow on Twitter. Walkaway was an interesting book. I was struck by how the characters were consistently challenged on their beliefs (even if it was clear which beliefs were endorsed by the author and which group would emerge victorious). Also at some point wasn't there some talk of a book club type thing here? If anyone is interested in say reading the same book for Sept or whatever and then talking about in a post I'd be game. We did Gravity's Rainbow, Infinite Jest, and Pale Fire with varying levels of success and involvement. Those are the ones that I remember being planned group reads. Yeah, I guess maybe those were what I was thinking of. I started Infinite Jest a long time ago (says a lot of people) but haven't really picked it up again. Right now my copy of Infinite Jest is being used as a stand for my baby monitor. Good thing started off the club with light, breezy reads to maximize engagement early. heh, that's exactly what i just thought. Trying to weed out the riffraff. eschapp - in answer to your second point, I'd be willing to give this a try, provided the assigned title is safely within the riffraff realm. ...I've never owned Infinite Jest, nor have I had any real urgency to remedy that. I'll also admit that I've never touched any Pynchon either. Cool any other riffraffers out there? I'd read more, but time is fleeting. The crying of lot 49 and inherent vice aren’t the highfalutin pynchon. They’re also good fun. I reread the Dune series (from Dune through the last one from the old man) about every 4-5 years.